Here’s why your dishwasher is not cleaning well and what you can do about it. Your detergent choice is important and you have no idea how important it will be in the up coming years. You see these labels called an energy star ratings? To meet the requirements appliances have to meet certain water and electrical usages to meet the qualifications. Not only that but the qualifications get even stricter every 2 years. So what that means to us is that our dishwashers are not cleaning well as of now and are only going to get worse. Remember back in the day when the dishwasher was finished and you could hardly touch the dishes because they were so hot? Or maybe you remember that “Plate Warmer” label on the dishwasher that no one ever used? Well that was due to the heater. It was a beast. It probably came out of an old 30 year old used commercial oven in the old Hobart made dishwashers. Some would be 5-10 amp monsters that only had one function, to make things hot or die trying. How hot?? As hot as we can get em’, this is war! Well all of this heat had to come from somewhere and that somewhere was the electrical plant down the road. We pay money for electricity to make our dishwasher work, clean the dishes, dry the dishes and have unused options all over the control panel that we didn’t know what to do with. Notice the big ol heater in the bottom. So here comes Mr Energy Star guy and says that you’re using too much electricity, to which I respond “Yeah, and I’m paying for it, when you’re paying for it then you can tell me how much to use.” and because it’s run by the big ol guberMINT, they don’t care. Shut up, get in line, here’s a crappy dishwasher that don’t work, and btw you can’t have phosphates anymore (I’ll get to that later) either. KTHXBYEBYE. . . Vote for me again sucka!! What we are left with now is a bunch of dishwashers that use less water and less electricity. They accomplished this by running them longer and shortening the heat cycles. They make the motors smaller and smaller and just run them a long time, make the heaters smaller and again run as little as possible. Without heat, leading to your dishwasher not cleaning well. Now on to phosphates. Phosphates are cleaning machines. They’ll clean the stink off of you know what they work so well. Ever use TSP? That’s trisodium phosphate and it’s recommended before painting because it works so well to get grime, grease, gunk. . . all that stuff gone so the paint will stick to whatever surface you are painting. But on the downside, it also feeds algae, contributing to algae blooms and as a fisherman that’s a bad thing. It kills fish, hurts the water. . . . bad stuff that algae can do and it eats phosphates and nitrogen and grows faster. Or at least that’s what they tell us. Without heat, and without phosphates and with less water how in the world is this dishwasher going to work correctly? We will have to depend on detergents, and in the dishwasher world these are made up of enzymes, bleach and surfactants. “Surfactants are compounds that lower the surface tension between two liquids or between a liquid and a solid. Surfactants may act as detergents, wetting agents, emulsifiers, foaming agents, and dispersants.” That’s from google. What we need to know about surfactants is they keep beads of water from forming and they like clean water, so they help to keep from redepositing grime on dishes. Enzymes are like little bugs that break stuff down, or it’s just easier to think of them that way. Enzymes are also killed, or neutralized, or made useless by a few things. The two that are important to us are 1. bleach and 2. heat. Enzymes work the best around 120 degrees F and die at 140 degrees Fahrenheit (or as Drew calls them “Freedom Units”). Bleach also kills enzymes and it renders the bleach useless in the process. That means you can not combine the two of them and expect them to work because they’ll duel to the death of each other leading to your dishwasher not cleaning well, or at all for that matter. In the course of a dishwasher cycle once the detergent is let loose to the battlefield water gradually heats while enzymes attack starch and protein stains until they are killed by heat and then the bleach is released to remove the remaining stains and get the remaining funk gone. Remember enzymes are most active at 120 F and die at 140F. Bleach is most active between 140-150 F. The surfactants kind of hang out on the surfaces of things forming a barrier against grime until clean water comes along and removes them in the final rinse. Then in the final rinse more surfactant (2-6ml or drops) is added to help the dishes dry by sheeting the water off of them instead of relying on the heater to heat dry them. What this means to us is that if you continue to try and use traditional dishwasher liquid or powder in a modern dishwasher you’re going to have a bad time. Remember how the enzymes and bleach kill each other? That means that there can only be one of those in a powder or liquid detergent. Monodose type (the packets or tablets) are becoming more popular and that’s what I use and recommend and I’ve had good results with both the Cascade and the Finish brand. I tried the sams stuff and it sucked. What I’ve found using these combined with a rinse aid is that my dishwasher stays cleaner and there is a noticeable difference in the dishes when they are done. Also it depends on your water hardness as to what you have to use so you may have to experiment with a few of them. See that wasn’t so bad now, and you know way more than the average guy and even some “techs” about how your dishwasher works. 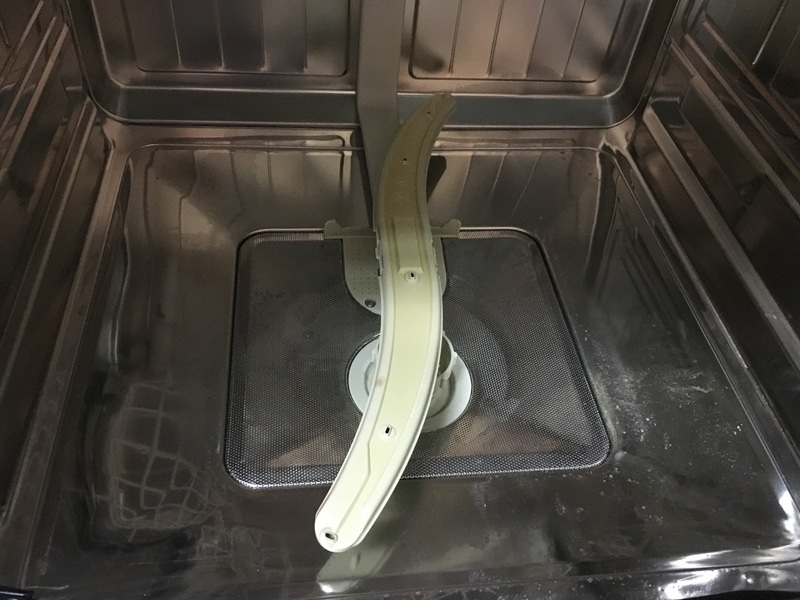 Use the right stuff, and although your dishwasher doesn’t work like the old one you can avoid the whole “dishwasher not cleaning” well problem and in the process keep it from stinking up the kitchen.